Household size is a key factor in determining eligibility for the premium tax credit. The following Q&A explains the rules on household size and how it affects eligibility for and the amount of the premium tax credit. Why does household size matter when calculating eligibility for the premium tax credit? How does the marketplace establish household size to determine eligibility for the premium tax credit? Maria and Simon are married and have one child, Elaine, whom they claim as a tax dependent. They have a tax household of three people and earn $35,000 a year (which is 168 percent of the poverty line in 2018). Elaine is eligible for the Children’s Health Insurance Program (CHIP), making her ineligible for a premium tax credit, but she’s still included in Maria and Simon’s household for determining premium tax credit eligibility. Suppose that Maria and Simon also have an older daughter, Cora, who is 22 and living at home with her parents. Cora just graduated from college and is working full-time. She cannot be claimed as a tax dependent by her parents and files her own taxes. Even though Cora lives with her family, she is a household of one for premium tax credit purposes because she cannot be claimed by her parents. Who can be in a household together? The composition of the household for premium tax credit purposes follows Internal Revenue Service (IRS) rules for filing status and dependents. For more information on tax rules, see The Health Assister’s Guide to Tax Rules. How do you determine the household of married couples who file separate tax returns? A married person qualifies to file as head of household. A person who is married but does not plan to file jointly with a spouse can sometimes qualify as Head of Household, a filing status that allows a person to be eligible for a premium tax credit, rather than Married Filing Separately, which does not. In general, a person can be Head of Household if he or she is unmarried or considered unmarried. A married person is considered unmarried if he or she will live apart from his or her spouse in the last six months of the tax year and pays more than half of the cost of keeping up the home for their dependent child. The household of a person who qualifies for one of these exceptions includes the person and anyone he or she claims as a dependent on the tax return. Do family members have to enroll in the same plan to be included in the same premium tax credit? Serena lives with her son, Jacob, and her aunt, Martha, who Serena supports. Serena is a tax filer and claims both Jacob and Martha as tax dependents. Because most insurers wouldn’t include Martha in a family plan covering Serena and Jacob, Martha will be in a separate health plan. 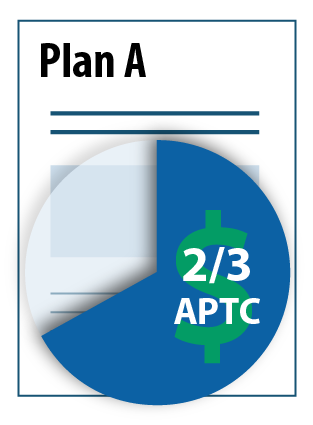 However, even though they are covered through separate health plans, the family is still one tax unit, so their premium tax credit is determined as a household of three, and the advance payment of the premium tax credit (APTC) is applied proportionally to the two plans (see Figure 1). 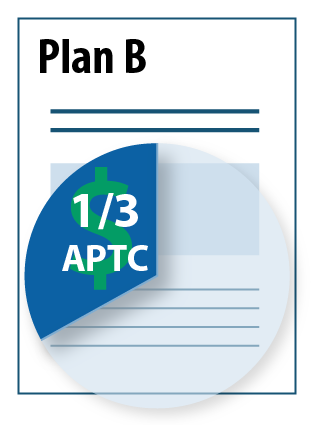 Even though part of the advance payment goes to Martha’s health insurer during the year, Serena will claim the tax credit and be responsible for reconciling the entire household’s APTC, including Martha’s portion. Because Martha is a tax dependent, not a tax filer, she cannot directly claim a premium tax credit. Brian and Anika are married and file taxes jointly. Their 23-year-old daughter, Olivia, is not a dependent and files her own tax return. Even though Olivia is in a different tax household from her parents, she can enroll in a plan with them because she is under 26 years old. However, even if they enroll in a family plan together, the premium tax credit amount will be determined separately for each tax household (see Figure 2). Brian and Anika’s premium tax credit will be based on their income as a household of two. Olivia’s premium tax credit will be based on her income as a single household member. At tax time, Brian and Anika would file a tax return and reconcile their APTC amount and Olivia would file her own tax return and reconcile her APTC amount. For a non-dependent child like Olivia, her share of the premium and her premium tax credit amount do not vary based on whether she enrolls in a plan together with or separately from her parents. In either case, the premium Olivia owes will be based on her age, location, and smoking status, and her tax credit will be determined by her income. Having a non-dependent enroll together with other family members also makes reconciliation of the credit more complicated. Given that, even though it’s permitted, there aren’t many benefits to enrolling people from separate tax households into the same marketplace policy. How do mid-year changes in a person’s household affect premium tax credit eligibility? A married couple with a projected income of $35,000 has income at 213 percent of the poverty line. If they have a baby sometime during the year they become a household of three and their income would be 168 percent of the poverty line. This change in poverty level income will lower the household’s expected contribution from 7.01 percent to 5.01 percent of income, which will make them eligible for a larger credit. To ensure that individuals receive the correct premium tax credit for the year, household size and other changes should be immediately reported to the marketplace. Are premium tax credit and Medicaid households the same? No. For the premium tax credit, members of a tax household are always in the same household when determining their eligibility. For Medicaid, household size and composition are determined separately for each member of the household. The rules look at more than just tax filing status; familial relationships and who physically lives in a household are also part of the determination. In some cases, Medicaid follows the premium tax household rules, but in some cases it will not. In addition, household rules for the premium tax credit are uniform across all states, but Medicaid provides some state options — such as some flexibility in the age limits for the definition of a child — that result in variability in household size depending on the state. For more information on the Medicaid household rules, see Key Facts: Determining Household Size for Medicaid. How will the marketplace determine whether to use Medicaid or premium tax credit household rules to determine eligibility? An applicant can’t be eligible for a premium tax credit if he is eligible for Medicaid, so the marketplace applies the state Medicaid rules first. It determines the family size of each individual in the tax household using Medicaid rules. (If the individual is assessed or determined eligible for Medicaid, he will be transferred to his state’s Medicaid agency.) If the individual is ineligible for Medicaid, then the marketplace will look at his household and eligibility for a premium tax credit using premium tax credit rules. For updated yearly percentages, please see Reference Guide: Yearly Guidelines and Thresholds.